How technology took a non-threat and turned it into an unbeatable force. 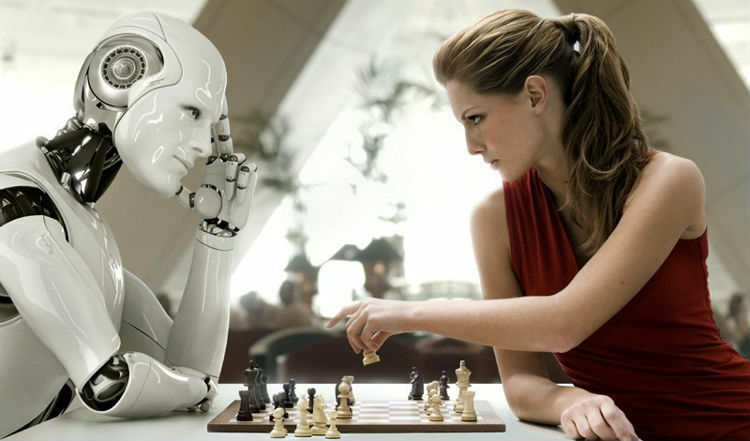 Since the days of the Mechanical Turk, people have been interested and amazed by the idea of machines that could learn to play chess better than humans could. Of course, we now know that the Mechanical Turk was a ruse and not really Mechanical at all, being operated by a hidden grandmaster who was controlling all the moves – but the fascination has remained. The idea of computer chess had already been around for some time before this, but that’s all it was – an idea. In the 1960’s, it started to seem possible. Advances in “Cognitive Simulation,” which we now call Artificial Intelligence, or AI, led to the development of algorithms that could simulate a very narrow, specialized aspect of human intellectual ability, like playing chess. 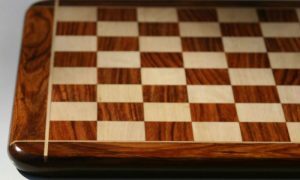 In 1962, a team at MIT was able to create a simple chess playing algorithm that could beat an amateur player some of the time. Programmer and strong chess player Richard Greenblatt added some more advanced features to this algorithm in 1967, which enabled it to achieve a strength score of 1400 – about the same as a talented high school player. This excited scientists of the time so much that one eager man was quoted as saying that, “machines will be capable, within 20 years, of doing any work a man can do.” Well, we’re not quite at that point yet, but AI has certainly come a long way in the last 50 years. While research in the 1960’s provided a good foundation to build off of, things really started to get interesting in the 1970’s. 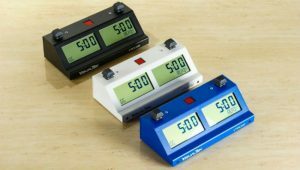 The availability of increasingly more powerful hardware led to increasingly stronger chess software, allowing chess machines to make deeper searches on each of their turns. 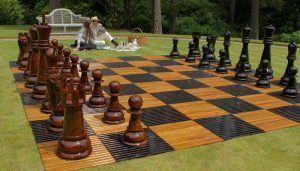 Technology in chess at this time was growing at an expeditious rate, roughly doubling in power and speed every two years or so. 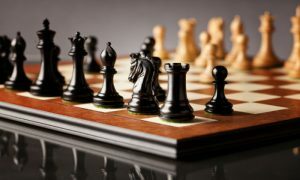 The main software improvements were made by taking advantage of the new, faster software and also improving the way that the chess computer searched for moves each turn by optimizing the process with trees. This optimization allowed the computer to search deeper for a good move on each of its turns, and to do it all faster than it could before, which is a critical skill when the chess clock is ticking away during a match. These specialized chess computers of the 1970’s were getting stronger and stronger, to the point where they could actually challenge master level, titled players. 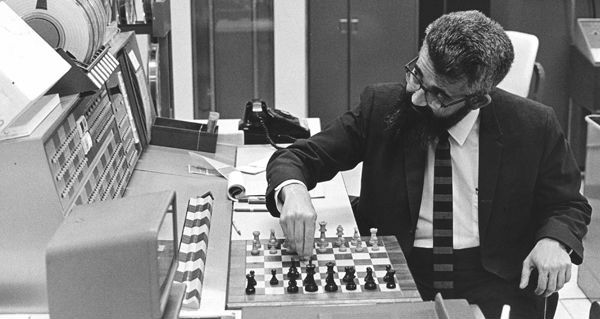 In 1968, IM David Levy had bet AI researcher John McCarthy that there would not be a chess computer made within the next decade that could beat him. That match was scheduled in 1978, and Levy did win, though it was a close thing. It was lucky for him that he got the match in when he did, because chess computers were just about to graduate to grandmaster levels of skill in the next few years. In the 1980’s, computing in general began to explode in popularity. 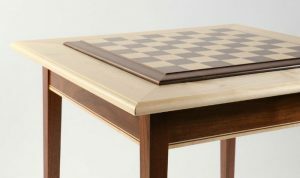 Personal computers were making their way into homes and offices everywhere, and amateur programmers began playing around with chess algorithms of their own creation as a hobby. Professionally made chess programs were also made available for sale to the public. These programs were only at an amateur level of strength, but they became very popular and began to cement the idea that one of the things these strange new machines were good at was playing chess. 1980 was also the year in which the very first World Microcomputer Chess Championships was held. This event was the first chess competition to feature solely computer contestants. The prestige of winning this event, coupled with the Fredkin Prize which offered a $100,000 award to anyone who designed a chess computer able to defeat a reigning World Champion, motivated programmers to focus their attention on advancing the strength of chess computers as quickly as possible. 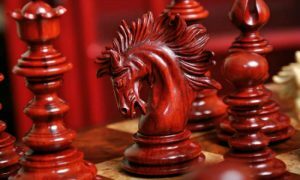 Researchers at Carnegie Mellon led the way with several cutting edge programs, including Deep Thought, which became the first chess computer to achieve a grandmaster level strength rating of 2400. It did so in 1989, and that same year it was able to claim victory over several different human grandmasters. With those successes under its belt, the team felt that they were ready to finally take on reigning World Chess Champion, Garry Kasparov and claim their share of the $100,000 Fredkin Prize. 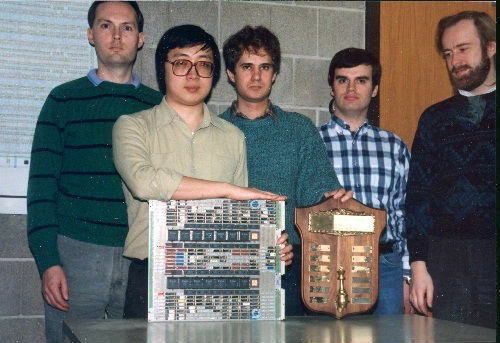 The team behind Deep Thought ultimately considered the 1989 match against Kasparov to be a success for their machine. 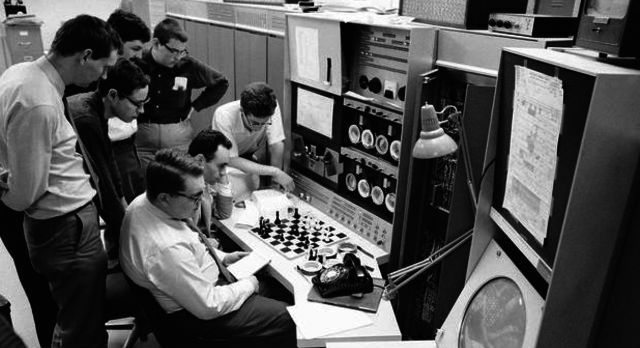 They demonstrated what they wanted to demonstrate- that chess computers were now advanced enough to sufficiently challenge the highest rated human players. Nevertheless, they were focused on building their next bigger, better, machine, and Deep Thought was sold to IBM. They renamed the computer Deep Blue and began instituting a number of different upgrades and changes that they felt would make it better able to defeat Kasparov in a rematch. 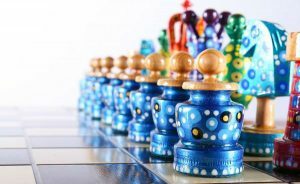 The IBM team upgraded Deep Blue’s software and dramatically upgraded its hardware, making it able to now calculate more than 2 million potential chess moves per second. After nearly 8 years of improvements, Deep Blue was ready to challenge Kasparov once more. The rematch came in May of 1997, once again in New York City. Instead of an auditorium, though, the match was hosted by a small television studio so that it could be filmed and broadcast all over the country. A total of 6 games were played. Game one was handily won by Kasparov, who employed the King’s Indian Attack that is commonly seen in club play, but not usually used by grandmasters. After nearly 8 years of improvements, Deep Blue was ready to challenge Kasparov once more. In game 2, Deep Blue began with the Spanish Opening and eventually forced Kasparov to resign his position. This was one of the most interesting games in the match, and indeed in chess history, because it turned sour so quickly. Kasparov seemed to become flustered by the machine and failed to notice a move that could have put his Queen in perpetual check, resulting in a draw, rather than resigning his position. There was also a very bizarre moment when the normally stoic Kasparov accused the machine of cheating by somehow having knowledge of his moves. Of course, since that knowledge only existed within Kasparov’s own mind, that would be impossible. Game 3 started with Kasparov deliberately choosing an uncommon opening, the Mieses Opening, that he thought might not have been programmed into the computer, and therefore wouldn’t be recognized by it. Deep Blue seemed to take this in stride, and the game ended in a draw. Game 4 was a win for Deep Blue, and game 5 was a draw, though it seemed that Kasparov had the early advantage. Game 6 would decide the match. In the final game, Kasparov used the Caro-Kann defense, thinking that the computer would not be able to make the early sacrifice that would allow it to circumvent the strategy. Unfortunately for Kasparov, Deep Blue knew what to do and sacrificed its Knight, a move that would quickly dismantle Kasparov’s defense and led to a win for Deep Blue within 20 moves. Deep Blue had won the match! This was the exact moment in history that the tide turned, and computers outpaced human skill at chess. The victory of “Deep Blue” was the exact moment in history that the tide turned, and computers outpaced human skill at chess. 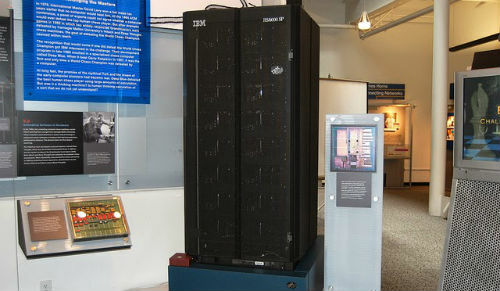 As the world looked on in 1997, Deep Blue proved that computers could in fact beat human players at what was once seen as the ultimate game of human wit and intellect. Now, that match is widely regarded as one of the most iconic matches in chess history. Due to the nature and speed of technological advancements, computers will likely always remain superior to humans in chess strength. The fact of the matter is that computers can learn and advance their skill at a much faster rate than humanity can, so that fateful match in May signaled the end of an era that we will not likely see again – one in which human intellect was greater than that of computers.